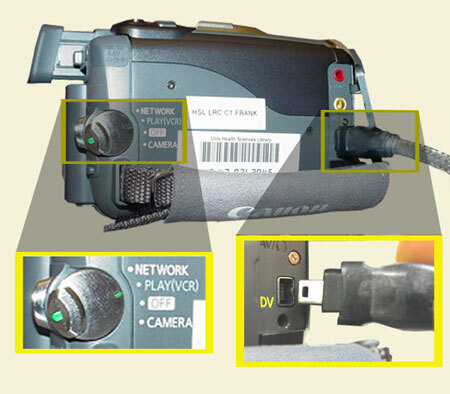 When I bought my fancy digital video camera, I read the thick manual extensively and nowhere was to be found any instructions how to download the moving images to my computer. When I was at my cousin's and promised to use my flair for electronics to do the same for her, I found the same problem! Is it supposed to be some secret conspiracy that the manufacturers fail to instruct their customers of this incredibly important point?? My guess is that the software that comes with the camera isn't fancy enough to do that, for which reason they do not explain it. Otherwise, they might be forced to suggest certain software for this purpose, and then they would want money for making such a suggestion, and since they didn't receive the money, or it would be too much hassle to go through the process and write up a contract etc., they can just be lazy and not mention anything. Well, these pages are not reserved for my opinions of mega large corporations in general, so I'll just fast forward to the important and juicy parts. And why not make yourself look like a genius while you at it? In front of all your friends, casually pick up the device and start looking for any secret compartments. Maybe a very small flap that removes a part of the cover. Get creative. Don't pull too hard but fidget the various parts which look like they could open up until you find... the secret compartment of fancy input/output thingy wingies! 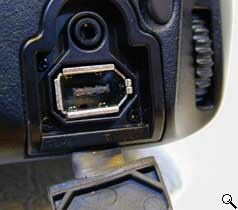 Once you find that, you should find the standard four pin firewire port. 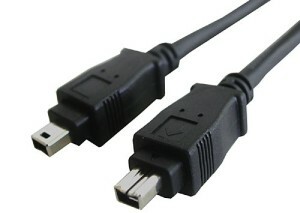 Yes, firewire, which is supposed to be faster than USB2. 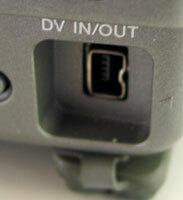 On a desktop computer you might have a six pin port (on a laptop generally also four), in which case you buy the four-pin to six-pin cable. Just go to a good computer shop and explain to them your problem, I'm sure they will be able to help you. 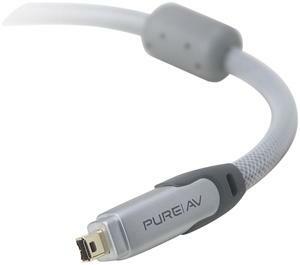 And even sell you this rather expensive cable, agreeing to take it back within 10 days if you fail miserably. 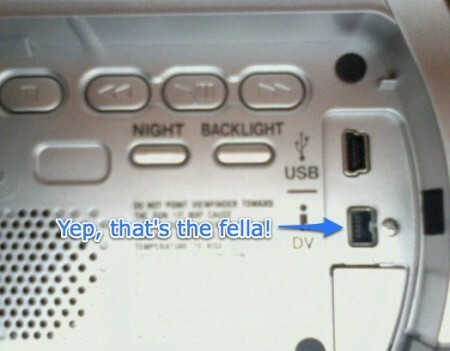 And what if your computer doesn't have a firewire port? Well, run out and buy one dingaling! For a desktop I just took apart the computer and slid it into the slots, and the thing worked like a dream. Obviously you want to turn off and disconnect from the power supply your computer before doing something like this, but I found this surprisingly easy, at a time when I was generally scared to deal with hardware and taking apart computers. You can even remove it and take it to your friend's computer etc. 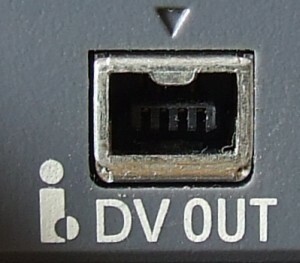 If you want to use your laptop (not necessarily advisable - explained below), you can get a PCMCI card (those things that look like a thick credit card and slide into that horizontal empty slot on your laptop which you often wondered what the purpose of was for) with firewire, or firewire and USB2 capability, if you desire that as well. But the reason it is not so advisable to use your laptop for this, unless you have a really beally fast laptop, is because once you want to export your created film to another format (such as an .avi or .mpeg file, or a DVD you can play on any DVD player), the export process gobbles up a HUGE amount of processor power. Meaning your laptop will be running at 100% for hours. And since laptops generally do not have much breathing space inside, this can overheat the parts inside and possibly reduce its life. So before you run out and buy the fancy firewire cable, you might want to consider this and try to do your editing on a fast desktop computer (Pentium IV, 2.5 GHz+ advisable). 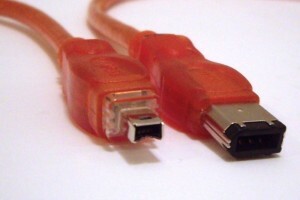 Once you've chosen your software (experimentation can be advisable - certainly wont hurt your computer), usually what I find necessary is to turn on the software, plug the video camera into the cable and computer, and then turn on your video camera to play mode. 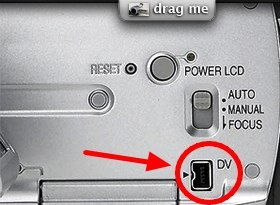 Or some similar or logical mode (not record - unless you want to use it as a webcam, which I think should be possible). If using XP then it should go through its usual procedure of "found new hardware" etc. Let it install your device. Or perhaps the camera came with an installation CD. Note that there is a difference between editing software and installing drivers for your device. The "driver" is like instructions to your operating system about the device. XP is usually quite rich in drivers so that it will recognise and install almost anything you plug into it, so these installation CDs are usually reserved for older versions of Windows, such as 98. Make sure to read the instructions or manual first for how to hook up or install the device. Once you've installed your device or once your computer has recognised it and installed the driver automatically, you should be ready for downloading. You don't necessarily have to turn on the program first. Some programs might be better for different things. For example, I found one video editing program, although much more simple than the Adobe, was good at rotating large sections of the image, because I was a bozo and held the camera on its side, forgetting that TVs do not usually rotate so easily, and people don't like rotating their heads likewise when watching your edited movies. Another program I found good for exporting the clip into DVD format, while still another program was good for importing into the computer video images from a VCR. Once your device is installed and recognised by your computer and you are ready to try and import/download the video images to your computer through your super fast and fancy firewire capable, on your selected or experimenting software, you'll usually want to find somewhere in the menu something like File > Capture Movie. Or maybe through some Import function. But generally a Capture menu should do the trick, or possible Acquire. Once you open your Capture menu, you should play around with the settings before "capturing". 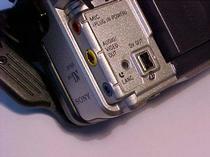 For example, is your camera NTSC (US) or Pal (Europe)? Here you can usually also set the image size, the quality of the sound (22MHz as opposed to 44MHz) and other factors. The best bet is to simply capture little clips and then play them, or export them afterwards to .avi to see how the quality looks. Make sure to play around with this first, to establish the best possible option. Note also that higher quality settings will inevitably require much more disk space. For my trip to Mexico, four tapes added up to about a hundred gigabytes. Not a small amount of space. So you might want to have an external harddrive for this purpose. And once you download all your clips and eventually want to export them into a single file, the size of the exported file could also take up many gigabytes. So make sure you have plenty of available storage space before you plan to download a lot of videos. When downloading, I find, even the great cameraman that I am, that I only want to download selected clips. It is here that you'll probably learn to appreciate movie editors, because it is a tricky business and one of the most important parts of making a good movie. First you should have a rough idea of what you want to accomplish. 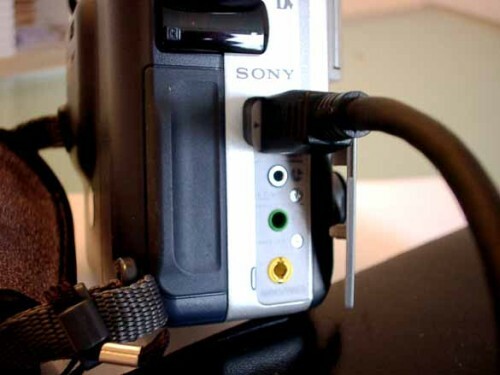 The tapes are not that expensive so you can always store them somewhere and download other parts of your "raw footage" for other movies later. So first I like to selectively download clips. On many programs you can press the Record button, or sometimes the Play button in the software, and you'll be amazed to hear your camera start playing. But I find that controlling the camera in this way through the software generally leads to problems, and that the most error free and smooth way is to press Play on the camera and then Record on the software. Keep in mind that it may take a while for your camera to warm up and run smoothly, so press Play a bit before you want to record, and then press Record (usually a red circle) a bit before the actual clip you want to capture. Again, experiment in the beginning until you know what works best. Remember that you are transferring a lot of info at a very high speed, so be patient with your computer. Especially if it's not a particularly fast one. You can fast forward or reverse to cue up to the parts you are interested in, and then simply press Record once you want to capture, and Pause once you are done capturing. In this manner you will save to your computer little video clips, which you will be editing later (cutting to size, adding to other clips, etc.). Once you've captured a small clip, play it on your computer, test export it, and make sure all your settings are optimal before you spend the next couple of hours downloading clips from your various tapes. Another thing you might consider is to turn off the Preview. When recording from your camera, if while recording you hear and see what you are downloading on your computer screen, if your computer is not fast enough, previewing the imagines WHILE you are downloading them can lead to little quirks in the clips you download, or even cause your whole system to seize, freeze and crash. Most of these cameras should have a fancy little TV which pops out for viewing while recording, so I prefer to use that for previewing while downloading. Keep your mouse hovered over the Pause button while you watch your little video camera TV, and press Pause (or the Escape key on the keyboard might work) when you come to the end of your selected clip. Once you've got your settings all right and have downloaded your little clips to your computer, you can use the same or different software to start editing your movie. Just open your software of choice, and usually go to File > Import, and import the .avi or whatever file names you created when recording or capturing. You are not actually importing the clips into your software, like converting them to another format or anything, but simply placing them into the software like little thumbnails. The hardest may be capturing the clips onto your computer. Once there, these large files can be manipulated with little commands: insert that file here; cut the file at this point; designate this segment to such and such a position. You are not actually cutting the files and moving them around on the computer, but rather creating an instruction file, probably of simple text format. This can also include special effects. When you're done editing, cutting, moving around and adding special effects, THEN you are ready to apply all these little instructions and create a new .avi or other file. It is this Export process that will require a lot of computer power. Your software will be following your commands to take certain segments of certain clips, move them to different areas, add special effects... Heck, your Export command might even convert the quality and format of the captured images, such as from NTSC to Pal, or from Pal to MPEG for the web, where the resulting image will be much smaller than the original. This Export function you can decide on at the end. You can even export your edited movie into different formats: one for DVD, another for a smaller .avi file, and another as an mpeg file for the web. But be prepared to let your computer run at full speed for several hours. Make sure to keep it cool somehow, so you do not harm it. A good editing job makes a good movie. Nothing worse than being invited to someone's house to watch home videos, where for hours you might listen to: "Look, there is my hand. I'm a star eh? Oh, and there is our daughter when she was 3. And here she 3.2 years old. Isn't she cute?" No, sorry, your "movies" are pretty boring. Maybe interesting for you and for sentimental reasons, once you're an old fart with your teeth fallen out and you want to go back in time and reminisce about all the good times. But not necessarily interesting for your friends. First of all, you want good raw footage. Even though the tapes themselves can be fairly cheap, it doesn't make so much sense to have hours and hours of useless footage. If you want to record you children as they are growing up, why not make a movie while you're at it? Much more interesting to view. Sit down like a happy loving family, write up a script together, prepare the dialogue, make some props, plan out a script and final punchline... It's great fun. But don't get too carried away with this initial process, because you may easily find yourself spending an entire Saturday just preparing for the movie, and then the day is over, you possibly haven't even started recording yet, and everyone has lost interest in your idea. When filming, don't be a shy dork and just stand there, but move around. Get in a good camera position - different for every scene. The top of a child's head is not so interesting from the perspective of an adult, standing high above. Get down to their level. Get below them even, to make them look like a giant. Compose your shots like you should compose your photographs. Don't just position the head in the middle of the viewfinder but look at the entire scene and balance the background with the foreground. Shift to the left or right etc. so that the background does not somehow blend strangely with the contours of their face. Look at the entire scene and create a balanced and pleasant to look at composition before you start filming. You can even move things around in the background. These are all things that the army in Hollywood regularly concern themselves with. So take some time to compose properly before you start filming. Occasionally you might consider using some of the special effects on your camera. Once common one is Backlight, where you can increase the brightness of the foreground (lets say a dark face) when there is some bright background affecting the light meter. Otherwise, you can add plenty of effects later on the computer. And for God sakes learn to hold your camera steady. Besides standing wherever they are standing and automatically positioning the person's face in the middle of the viewfinder, another mistake that beginner camerapeople do is to stare at the person while they are talking and not really pay attention to their hand (holding the camera) wandering all over the place. When you look through the viewfinder the person will remain in the same place, and it may appear okay. But if your hand wanders and jiggles, and the frame of the viewfinder moves around relative to the person, once you watch your movie on TV, the frame of the TV will remain in one place while the person will be jiggling and moving all over. Which can be quite annoying to watch. Especially if its supposed to be a movie, because such movements will constantly remind the viewer that it is a cheesey homemade movie and they will not be able to get absorbed into your movie like it is for real life or something. Professionals can sometimes do this on purpose (mostly when pretending to be an amateur cameraperson, as part a movie, or to be supposedly real cool and constantly happening when filming music video moderators), but their movements are very intentional and well composed. And forget about that wannabe artsy fartsy crap when you rotate the camera at an angle. Always look at the viewfinder and keep conscious of the frame relative to the composition within it, and pretend the frame is still and you are watching what you are recording on a stagnant television. Once you have put together some quality raw footage, occasionally you might want to preview it to double check that you captured the effect you were after. Or to motivate your actors and embolden them to express more believable feeling etc. But when cueing back and previewing like this, make sure to leave a little space afterwards, if necessary. 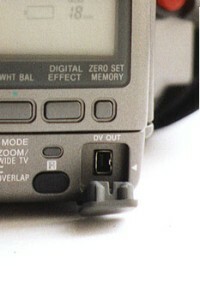 When you record and then press pause, the camera usually freezes the tape in a certain position. But when you press Stop and then cue back to the same position, some cameras might step back a notch when getting into the Record Pause state again, and inadvertently chop off or record overtop the tail end of your last scene. So be careful of this. When you are done with your raw footage, you might want to view all of it and think about the movie you want to make. It is here where you might get some other ideas. Like record a macro closeup of a ball and pretend it is an alien spaceship. Little snippets between scenes or which you might find useful later once editing on the computer. Once you're comfortable in your seat and editing, it is often too late to think of these little snippets, for the props are all put away and everyone is on their couch reading and not interested in doing any more acting. For my Mexico clip, I find I am usually quite selective before actually pressing Record on my camera. I don't like to pollute my tapes with a lot of useless garbage. Even so, of the four and a half tapes or four and a half hours of quality raw footage of beautiful California coastline, driving 120 miles through Arizona and Grand Canyon country, and little dirt roads in Mexico, I edited all that to only one and a half hours of final film. And even that I found was potentially a bit long. You will find this out when you show other people later - when you see them yawning. It is best to have short little clips or mini stories within your film. You might cut to a "commercial break", and make goofy and humorous little skits selling such and such. In movies, the story line always has ups and downs like on a roller coaster, to keep the audience on the edge of their seat. Don't have two hours of footage on the same topic, with the same consistent undrammatic events. Colour it up with this and that. Scare your audience into keeping them awake. Edit down to the real and interesting juicy parts. Occasionally you might film yourself and narrate your production, to explain things, and by this once again colour up your film with different scenes etc. Always think from the perspective of your future audience and never about how fantastic you are. A good musician and entertainer concentrates on its audience and produces something interesting for them. Think the same way. In case you're wondering how I embedded the video into this webpage, first I exported the clip to "mpeg for the web", which automatically selected reduced quality and size settings ideal for webpages. and the first link I found provided me with the html script for this. Or look through further links. I imagine you should easily find something. make sure you have enough free space on your harddrive to work with. You can clear up space on your computer through the computer tips instructions directly above. close all programs you do not need to help increase your available RAM. You might even consider buying more ram (more info on all this through the same computer tips link above). these crashing problems are more prone to happen on a PC. If you want to get serious about this sort of computer work, try borrowing or buying a Mac. Otherwise remove some of the more fancy video effects and simplify your movie. another little trick that can work is to piece together the clips that you want and export them into a single movie file, defrag that, and then import that into a fresh file, working only with a single and clean video file. You can then edit it further in the usual manner. Or you can add some effects, and when it starts crashing, export it into a single video file, defrag, import and start fresh again. The reason why it might be crashing is that you are issuing too many fancy commands.